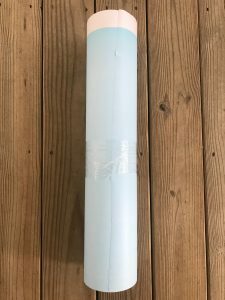 Why would Albuquerque residents need a professionally installed vapor barrier in their crawlspace? 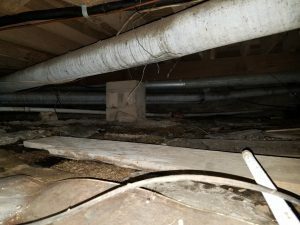 Does your home or business have a dirt crawlspace? If it does, groundwater or moist soil may create high humidity levels, which could start mold to take root and grow. Installing a crawlspace vapor barrier not only controls the moisture level inside the crawlspace from groundwater, protecting the wood framing from moisture and mold growth, it also protects against rodents and insects who thrive in an all dirt crawl space. If you need to store personal belongings in your crawl space it would not work in an all dirt crawlspace. Boxes would rot from the moisture on the ground. Our crawl space foundation and pillar liner come in 2, 3, 5 and 6-foot lengths. We install this product with our patented caulk and patented activation strip. SEE THE WHITE STRIP AT THE TOP OF THE PICTURE. We install this all the way around your crawlspace foundation wall to give you a “TRUE BARRIER SEAL”. After we install the foundation liner we install our vapor barrier liner around all the pillars. After we have completed these areas we can begin to install the ground vapor barrier sealing the foundation wall and the pillar liner to the ground vapor barrier giving you a truly sealed crawlspace that you could eat in. And we do this without drilling 200 plus holes in your foundation wall and pillars. You now have an NON-DESTRUCTIVE crawl space vapor barrier. Compare our starting 9 mil barrier material to most 12 mils reinforced vapor barriers. Ours is stronger and less expensive, for you the property owner. We don’t use 10% reinforced vapor barrier material like most crawlspace encapsulation contractors. At Mold Free Now Albuquerque NM, we use an extremely strong 9-mil 100% reinforced crawlspace vapor barrier, which is known to be one of the best low-budget vapor barriers for total encapsulation of a crawl space. This barrier is especially good for budget-conscious homeowners. BEWARE OF CRAWLSPACE VAPOR BARRIER COMPANIES that use 6 mil polyethylene vapor barrier that you can find at any hardware store. This is not what we use for your crawl space. Mold Free Now believes in using American made products whenever possible. Our crawlspace vapor barrier products are made in the USA and from premium grade ingredients. We do not cut corners on your vapor barrier. The vapor barrier material we use naturally resists mold and mildew growth. Will You Be Using Your Crawlspace For Storage? Move up to our 12 mil reinforced vapor barrier material. Compare our 12 mil product to other contractors 20 mils inferior product. The face of all our vapor barrier products is pure white in color, with a low gloss finish. If you will be using your crawl space for storage, we suggest you use our 12 mil reinforced barrier material, THAT COMPARES TO OTHER CONTRACTORS 20 MIL MATERIAL. When homeowners and business owners use their crawlspaces for storage they tend to get a lot of foot/crawl traffic. The potential for tearing is increased, although not likely. The white, low gloss finish gives your crawlspace vapor barrier a clean and finished look once it’s installed. Imagine a clean, healthy crawlspace environment that will also help keep your home indoor air quality better and save on your energy bill. Our 36 mil vapor barrier is custom designed to be the very best in crawlspace vapor barriers. Words cannot even come close to explaining the genius of this 2 part vapor barrier system. 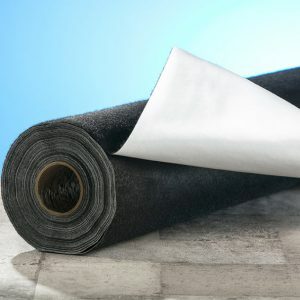 The padded felt bottom has the ability to take groundwater that has puddled and distributes it to dryer soil under the vapor barrier. This is great for homes or businesses that don’t need a sump pump but might get water from occasional hard rain. This barrier is also the very best for folks that expect the very best in crawlspace vapor barriers. Your crawlspace can be clean and moisture free. 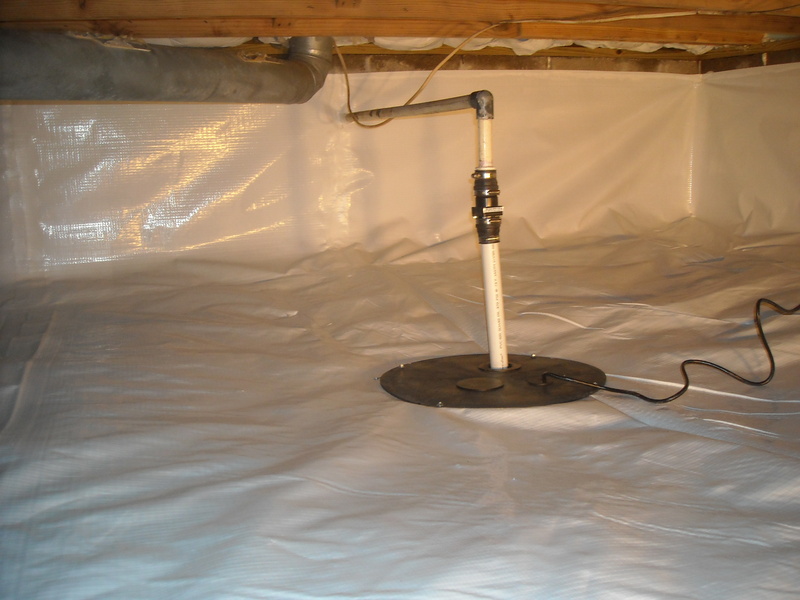 Mold Free Now can protect the health of your home, while also controlling the ground moisture level in your crawl space by properly installing a 9,12 or 36-mil vapor barrier. Mold, bacteria, and pathogens grow easily in a damp crawlspace. 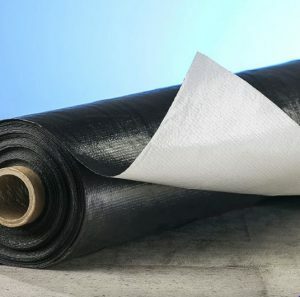 By having a properly installed vapor barrier you will greatly reduce mold, bacteria, and pathogens by encapsulating the dirt food source from the crawl space environment.